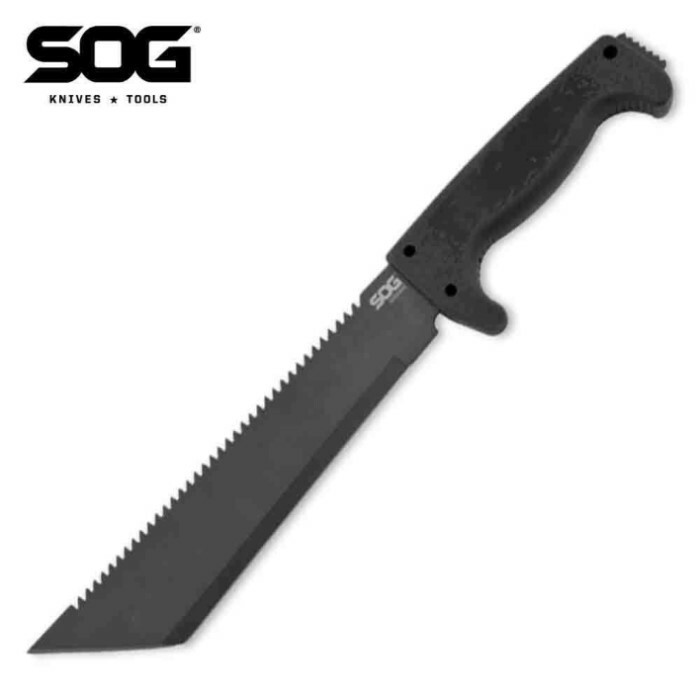 SOG SOGFARI 10 Tanto Machete | BUDK.com - Knives & Swords At The Lowest Prices! The SOG SOGFARI Tanto Machete is the machete for whatever the job! Whether you are clearing brush, building, chopping, hunting or anything else, this machete will help you get the job done, with ease. The 3Cr13 stainless steel blade features a black coating for a no-glare finish. The sawback serrations and spiked tang not only make this blade look fierce, but also add to the versatility of the blade. The Kraton handle provides a sure, secure grip. Includes a black ballistic nylon sheath with a belt loop for easy carrying.